Knitting inspiration from around the world. Become a Fruity Knitting Patron! Fruity Knitting appears regularly thanks to the financial support of our Patrons. 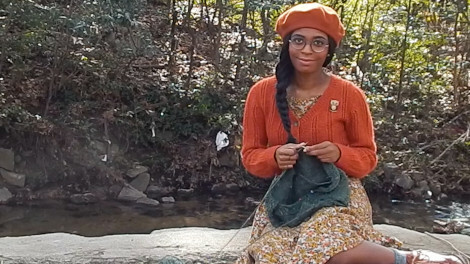 If you watch the show and believe in a fair exchange, then become a Fruity Knitting Patron today! It's easy and flexible. 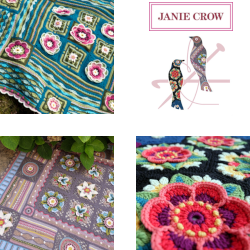 UK crochet designer Janie Crow is our guest on Episode 71. Last year on our way over to Snowdonia for our Christmas break, we visited Jane’s studio in north London. That was the start of my journey into crochet. By the end of the interview I has hooked (groan) and had great ambitions to tackle one of her beautiful heirloom blankets. Even if you don’t crochet, I think you’ll find the interview very interesting and inspiring. 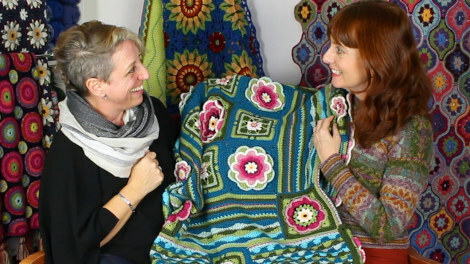 In fact, you might have to watch out or else by the end of the interview you will end up like me, wanting to take on one of the amazing heirloom blankets that Jane is very well known for. 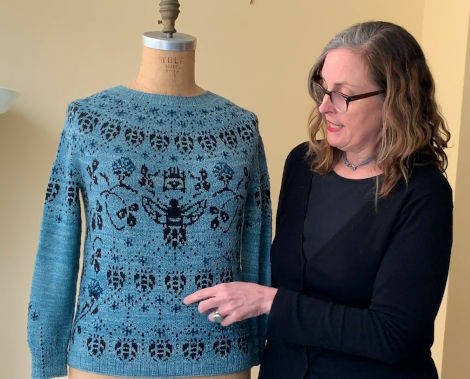 This Episode also features Constance Caddell from Columbia U.S. as our guest on ‘Knitters of the World’ and we hear about Catherine Clark‘s ‘Queen Bee’ design – Beyla in New Releases. 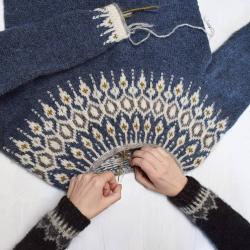 On top of that we have a short tutorial from Andrea, a contemplative knit by the river and new projects, old projects and steadily ongoing projects are shown. Enjoy! Janie Crow surrounded by her beautiful crochet blankets. Many of the blankets have featured in Jane’s Crochet Along events. Jane Crowfoot is a very talented U.K. crochet designer. She’s written several books and her work has been regularly featured in the Rowan knitting and crochet magazine. 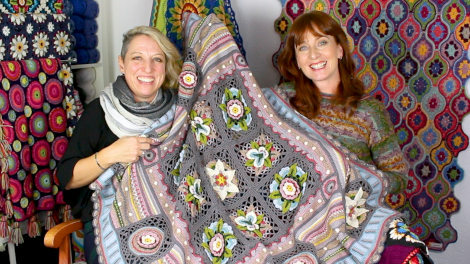 Jane really is top of her field in crochet and she is a very funny person as well, so I totally loved interviewing her. One of the most interesting parts of the interview for me was learning more about the history of crochet. There are some interesting surprises waiting for you there. We also discussed free form crochet, typical technical challenges crocheters have and we took an in depth look at three of her beautiful blankets. For those of you who are feeling inspired we are starting a ‘Crochet along’ CAL which will run all year and Jane has kindly offered our patrons a discount on three of her blanket kits. See the details below. 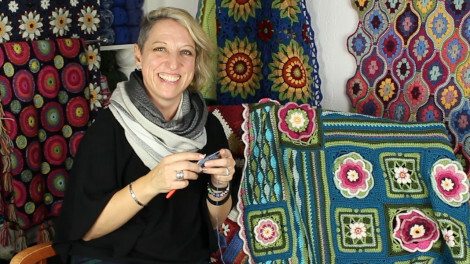 Janie Crow is offering Fruity Knitting Patrons a discount on three of her crochet along blanket kits – Lily Pond, Bohemian Blooms and Frida’s Flowers. You can find full details of this offer here. Constance is very accomplished in knitting, sewing and crochet. She has a particular enthusiasm for combining her skills to create complete outfits which reflect her personality. You are going to love meeting her! What an inspiring design with that beautiful, big Queen Bee at the center chest, the vines of flowers creeping around the sides and all the little worker bees making honey comb. If you need some extra power in your day, this is the sweater for you. The design is probably not for the fainthearted knitter but once you have finished, what a treasure you will have. 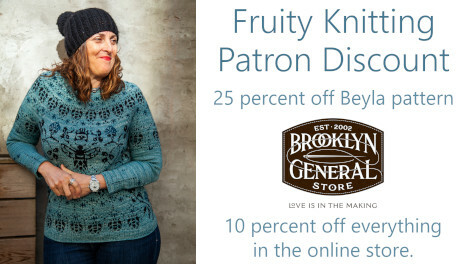 Catherine is offering Fruity Knitting Patrons a 25 percent discount on her new Beyla pattern, and she is also offering a 10 percent discount on everything in the Brooklyn General Store online shop. You can find all details of this offer here. Look, it’s finished and it’s gorgeous! This is Norah Gaughan’s Nightingale design from the Pom Pom magazine issue no. 27. It’s such a unique and interesting design with the cable pattern on both the front and back, looking like a coat of arms on a shield. For me there were two sections of this design that I enjoyed doing the most. 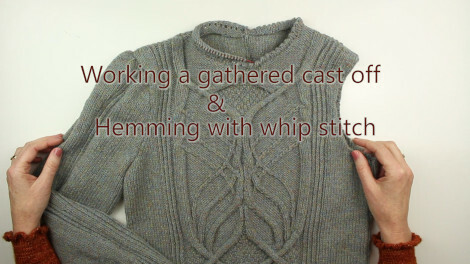 Firstly, I loved seeing how the puffed sleeves were shaped and then fitted into the armhole and second, I learnt a new way of finishing off the picot neck edging. I thought you would also love to see those sections in more detail, so I made a very short film to show you. Andrew is wearing his modified Traigh by Jade Starmore and Andrea is wearing her newly completed Nightingale by Norah Gaughan. In the interview Andrea is wearing Samphrey by Marie Wallin. Hi Velda. I think you’re meaning Lynda Marveng? You’re right, I’m considering making one of those blankets! Hi Andrea and Andrew, a thought about your hiking jacket. You could have a neutral blue zip but do the icord bind off in the green to match the inside of the collar. Just a thought! Hello Andrea and Andrew- thanks for another wonderful episode- it simply flew by so very quickly! I’ve been thinking about your hiking jacket Andrea and your zip dilemma! Just a thought- what about a matching zip and then using a ribbon (either plain or patterned either side of the zip and then inside the collar- I think that it could look good 😊 good luck with it- kind regards Elizabeth R.
Hi Andrew and Andrea, I thought perhaps you could use the bright green to do the icord down the front and use a plain blue zip. It would pick up the collar lining rather nicely. Andrea, I am inspired by both Janie Crow’s “Bohemian Blooms” blanket and Norah Gaughan’s “Nightingale” sweater. I am embarking on the blanket though a beginner to crochet. I know the basic stitches and am an accomplished knitter, so I’m going at the crochet with an “I can do this” attitude–we’ll see. It’s challenging/fun to learn something new. 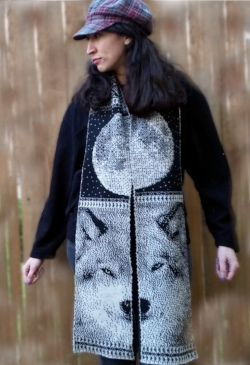 “Nightingale”–I also want to knit this sweater, yours is so beautiful! Like you, I’m not wild about doing it in a full worsted weight yarn. I am looking at Rowan’s Moordale, a 70/30 British wool/alpaca blend in DK weight. It’s 251 yds./100 g.; the yarn the pattern calls for would be 268 yds./100 g.; going by just that, Moordale is comparable. But the gauge on Moordale is stated at 23 sts./30 rows (on a #6), while the gauge called for is 20 sts./28 rows on a #7. Do you think the Moordale would work, knitting it to a 20-st. gauge? Hi Jane. That is a difficult question to answer. We would suggest that you try using yarnsub.com. That tool is set up to help you find alternatives to the recommended yarn. Be careful about how much alpaca is in the yarn, because alpaca behaves very differently to wool. You want to match the fiber content as well as the overall weight. Cheers, Andrew. 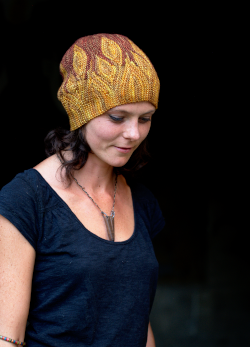 Woolly Wormhead is offering Fruity Knitting Patrons a 25 percent discount off all of her self-published patterns on Ravelry. Offer valid until 7 May 2019, full details here. 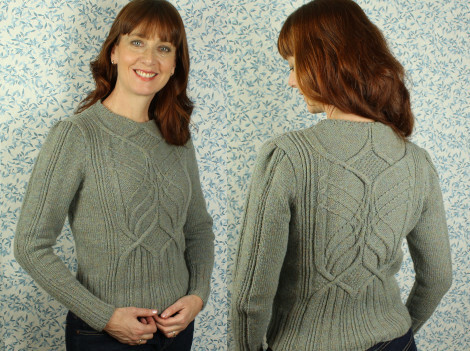 Celia Cabodevilla is offering Fruity Knitting Patrons a 40 percent discount off all of her self-published patterns on Ravelry. Offer valid until 7 May 2019, full details here. Lyndsey from Countess Ablaze is offering our Patrons a 20 percent discount on all yarns via countessablaze.com. Offer valid until 23 April 2019, full details here. 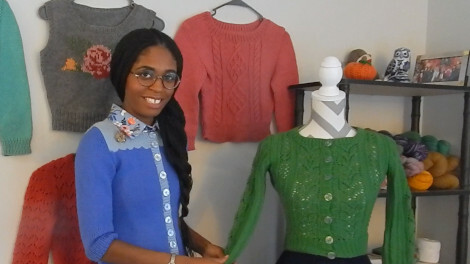 Jenn Steingass is offering Fruity Knitting Patrons a 25 percent discount off all of her self-published patterns on Ravelry. Offer valid until 23 April 2019, full details here. Fruity Knitting Patrons can get a discount on three of Janie Crow‘s beautiful crochet along blanket projects – Lily Pond, Bohemian Blooms and Frida’s Flowers. This offer is valid until 12 May 2019, full details here. 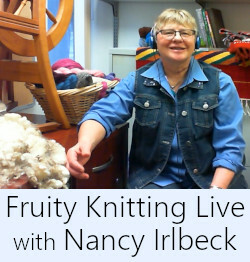 Nancy Irlbeck is our guest for Fruity Knitting Live, coming up on 18 May 2019. Merino Patrons can submit questions here, and Shetland Patrons can find details about attending here. 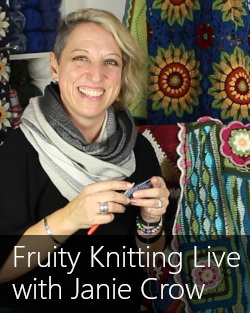 Jane Crowfoot is joining us for Fruity Knitting Live in June 2019. Merino Patrons can submit questions here, and Shetland Patrons can find all details about attending the event here.